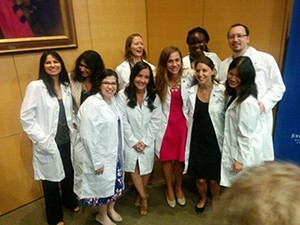 Each year, the Johns Hopkins graduate programs organize a white coat ceremony for graduate students to recognize the completion of their graduate board oral examinations (GBOs). For graduate students this test is the gatekeeper to our training; it transitions us from students to Ph.D. candidates and marks the commencement of our thesis work. The students are addressed by the deans of the schools of medicine and public health, as well as student representatives. This year the theme of the presentations was failure. We were reminded how we had all experienced failure in order to get to this ceremony — by admitting “I don’t know” during our graduate board oral exams — and how we would inevitably continue to encounter instances of failure as we embarked on our thesis work. While at first glance this message may seem unsettling, its truth resonated with all of the Ph.D. candidates at the ceremony. Our work will be, and so far has been, challenging; thus far experiments have failed, hypotheses have failed, and protocols have failed. While this aspect of science may seem ominous and even debilitating, one year after completing my oral exams, I’m beginning to realize the advantages of failure and the lessons to be learned from this threatening word. The interconnected wireless world enables protocols, tutorials and methodology to be easily accessible by a simple Google search. Experts create step-by-step videos in the Journal of Visual Experiments to remotely teach scientists complicated surgeries and techniques. Therefore, it should be easy to complete an experiment given sufficient materials and a well-detailed protocol. For example, in my molecular neuroscience lab, polymerase chain reaction (PCR) is a common type of assay that most trainees of my lab utilize daily. Whether it’s cloning or genotyping, we rely on a slew of protocols to perform these experiments, which are used to amplify and probe for specific sequences of DNA in a particular sample. I set up my PCR tubes, put my reagents on ice, fish out my experimental protocol, and just as I have for the past several months, aliquot the different components of the reaction, place my strip of tubes in the thermocycler and run the DNA products out on an agarose gel several hours later. Now is when the science actually starts. We can’t just “fail” and move on, forget that experiment ever happened. I need those data, and the fun begins: Now I get to be a scientist. Before, I was an apprentice, following a predetermined recipe, using the materials listed at the top of the protocol, pressing buttons to select a protocol that was already set up on the machine. Now I have to think. I have to reason through my day, understand what may have gone wrong and troubleshoot my way to success. While it would have been easier if those bright bands had illuminated in the gel box, my real training comes when those bands are absent; when I follow the protocol precisely and the experiment still fails. Following the ceremony, I was given a desk plate that read, “I’m pretty sure I have no idea.” While funny and fitting, I am beginning to realize that “failing” does not equate to not knowing. The experiment didn’t “fail” because I had no idea what I was doing. The experiment “failed” because it is an inevitable part of science and it is my job as a graduate student to figure out why. I recently edited the desk plate to read, “I’m pretty sure I have an idea.” Bring on the failure. I now know the blank gel is truly where my training begins.